As anyone who watched Mad Men can attest, the commercials and advertising of past eras are fascinating reflections of our culture. Recently, while watching a few of the educational films created by Centron, I couldn’t help but make a similar connection. These films, regardless of their specific purpose — whether to warn against the perils of gossip or the inherent safety ricks of trick-or-treating — have a lot to say about the morals and etiquette of their era. In fact, they are so steeped in their time that it becomes easy to overlook the talented individuals who created and conceived them. And a few of these individuals had imaginations that got a bit darker than you’d expect from the creatives behind What About School Spirit? 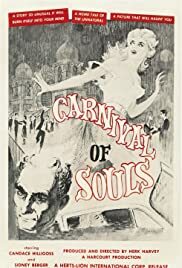 Consider the influential 1962 cult feature Carnival of Souls created and independently produced by two prominent Centron staff members (Herk Harvey and John Clifford) while on sabbatical. To call this haunting tale about a woman who never fully recovers following a car wreck influential would be an understatement. If you consider how director George Romero spoke of its immediate influence on Night of the Living Dead(also an independent production) then, as bold as it may sound, perhaps without Carnival of Souls our culture’s love affair with zombies may not exist today as we know it! 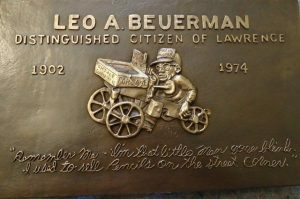 But for all their accomplishments the one film treasured the most by Lawrencians would have to be the Oscar nominated short documentary Leo Beuerman, an affectionate portrait of a local disabled man who, despite his disabilities, found inventive ways to insure that he was as independent as possible.This film, as well as the memorial plaque that was recently reestablished prominently on the corner of 8th and Mass, are testaments to how much our community appreciates and celebrates true individuals. -Blake Grossenburg is a Readers' Services Assistant at Lawrence Public Library.